Join Army veteran First Lieutenant Nathan Rimpf during a luncheon presentation as he shares how a harrowing moment in Afghanistan set him on a path to overcome obstacles and achieve success. Rimpf was serving as a platoon leader in the 1st Infantry Division of the U.S. Army – stationed out of Fort Riley, Kansas – when his unit was deployed to eastern Afghanistan in May 2012. Two months into his deployment, on July 8th, 2012, Rimpf was conducting a combat patrol when a landmine exploded. Severely wounded by the blast, Rimpf was medically evacuated to Bagram Air Force Base, then to Landstuhl, Germany and finally to Walter Reed National Military Medical Center in Bethesda, MD. Both of Rimpf’s legs had to be amputated. 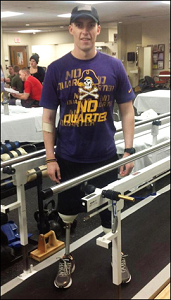 He spent nearly 18 months at Walter Reed for medical treatment and extensive physical therapy. Rimpf medically retired from the Army in May 2014 and began to focus on a future in business. 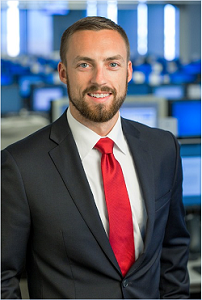 He attended the Fuqua School of Business at Duke University, graduating with an MBA in 2016. Rimpf now lives in Florida with his wife and works at a global investment bank. A Raleigh native, Rimpf attended East Carolina University on an ROTC scholarship and graduated with a degree in Exercise & Sport Science. He was commissioned in May 2010 as a Distinguished Military Graduate and Second Lieutenant in the Army Infantry. He moved to Fort Benning, GA in March 2011, graduating from the Infantry Officer Basic Course, the Infantry Mortar Leader’s Course, and Ranger School.